Thanks for visiting my studio during the fall Brewery ArtWalk. I was delighted with the number of people who came to my first ArtWalk open studio. I still have giclée prints from the cowboy series as well as Blue BBQ, Kiss a Real Man and St. Francis. They are available in several sizes. These archival giclée prints are printed on watercolor paper using pigment-based inks; beautifully capturing the colors and textures of my paintings. These prints would make fantastic holiday gifts. Visit my Prints section for the full selection of available prints and prices. If you would like to commission a portrait of either you or someone special in your life, I can still take on a few more portraits before the holidays. If you are interested, please contact me as soon as possible. If you have questions about my art please contact me. Again, thanks for stopping by. I look forward to seeing you in my studio at the spring 2016 ArtWalk. I will be participating in my first Brewery ArtWalk. I will have new and old paintings on display and for sale at my new studio, as well as a selection of exclusive and limited edition giclee prints. "The Brewery ArtWalk is an open studio weekend at the worlds largest art complex. With over 100 participating resident artists, you will have the opportunity to see new works, discover new favorites, speak with the artists and purchase artwork directly from the artists' studios. Admission and parking are free. Come and support LA’s finest artists, take home some great works and dine at the on-site restaurant." Emerging Los Angeles artist Jorin Bossen will be holding an open studio to showcase recent oil paintings Saturday, February 21, from 2:00 p.m. to 6:00 p.m. at 2605 Brighton Ave., Los Angeles. 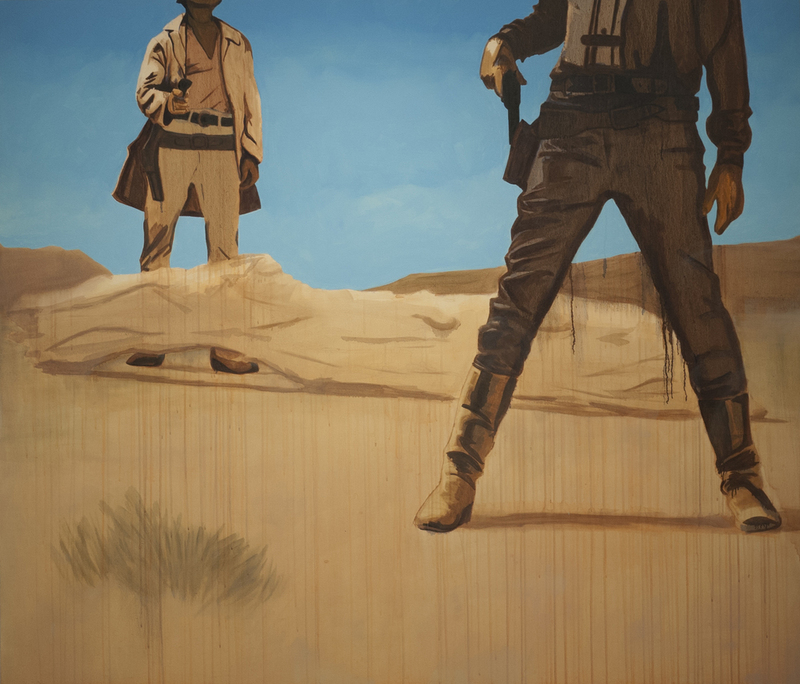 Best known for his cowboy paintings, Bossen’s open studio will be held in conjunction with his group show at the Torrance Art Museum, Manifest American Mythic: Contemporary Art and the Old West, which runs from January 17 to March 7. As a figurative painter, Bossen mixes figuration with abstraction and uses a combination of sheer washes, pastel pencils and oil paint to reimagine modernist archetypes and pop culture images. Roland Reiss, the influential California artist, professor emeritus at Claremont Graduate University, and the artist’s mentor, describes Bossen as “an outstanding painter with a potent grasp of the power to be found in contemporary images.” This is Bossen’s first open studio and will debut a number of paintings not previously seen by the public. Bossen’s work has been exhibited in Chicago, Detroit, Los Angeles, and Washington, DC and is in private collections across the country. His artwork has been featured in national magazines, most notably on the cover of New American Paintings. He earned his MFA from Claremont Graduate University. For information about the open studio contact him at 517.802.8822 or jorin@jorinbossen.com. The American West has been the site of assessment and reassessment by artists since before it was called Old and continues to exert an influence on the art of our own day. From concerns with individualism to the direction of the Nation, Manifest Destiny to ecological issues, from pop references to the historicized Western genre itself, we can trace ideas about ourselves and the notion of America through the glass of the West.